Imagine that you could get more energy from your daily actions. And because of all that you do, how much energy you could create! That is #RelaxIntoAction. And you will find the tools for Relax Into Action in this valuable e-book. To get you completely energized, in a way that fits perfectly into a yoga lifestyle. Are you often tired, more than you would like to? Is it hard for you to get out of bed? Do you feel tired, too often? Or are you just wondering how you could get even more energy in a way that fits your yoga lifestyle? I know that feeling only too well. In my personal quest to have more energy, for more than 10 years I have tried numerous tools to get more energy, bit by bit, step by step. That's why I think that this should be easier for you. For that reason I wrote this e-book for you. A book full of yoga lifestyle tools that REALLY helped me to feel more energized. As with everything you find on the YogaHabits platform, this e-book is also very valuable. Even although you receive it for free. Why? Because I like to help people with a yoga lifestyle and want to be able to stand behind everything that I offer. This e-book even has more than eleven thousand (!!!) words. In the same style as you are used to from my yoga blogs. Only now I have bundled many valuable tips that all contribute to your energetic self. Yes, it is true that I ask your e-mail address for this. And also there, I will use your e-mailaddress only with integrity. What you can expect from me is that you will be offered even more yoga lifestyle tools that help you to become your best self. Because I believe in you! What do others say about the book Relax Into Action? "You have written it beautiful and inspiring! Also in terms of the energy and the rhythm in nature. Very clear. So beautiful." ~ Amber Hanning. Do you feel like your energy goes up and down? Do you often need time to recover? If you are also interested in yoga, this book offers several tools to work on your energy level. I felt tired for a long time. In the past, it was more about the degree of exhaustion than whether I was tired. I wanted to feel energetic and started working on that by using the techniques later on in this book. I use the word work because I actually had to do something for it. Although I realize the importance of taking rest (as a yin element in our lives), I see a lot of people just like me that get stuck with how they do things. Some of the things that you put energy into will cost you energy, instead of creating more energy. In other words, a different way of dealing with yang energy. While searching for more energy for more than ten years, I’ve tried a lot of tools to get more energy. And experienced what really works for me. For now and in the long run. These yoga lifestyle tools also include yoga off-the-mat. 'Yoga' as the age-old knowledge that goes beyond just yoga postures. Tools that are based on relaxation within the action. If you have already been practicing yoga poses for a while, you have probably experienced that it helps to find a certain degree of relaxation while you activate certain muscles at the same time. During my own search for more energy, it turned out that the #RelaxIntoAction principle does not only work in yoga postures. Yoga also provides lots of tools that could be used off-the-mat. Energy has been an important theme in my life for more than 10 years. Sometimes happily because I was bursting with energy. But I’ve also been feeling tired (to a greater or lesser extent) for years. With the help of a yoga lifestyle, I started to feel more energetic. Full of energy to do all the things I like. And now it is time to give back by sharing these yoga energy tools with you. What to expect from this e-book? In this book, I share many yoga lifestyle tools that helped me. For example, the last few years I have experienced over and over again that whether or not I am using the rhythm of nature has a tremendous effect on my energy level. The Ayurvedic system provides insight into how this works. Another subject of what I will share in this e-book is the tremendous effect of mindset work. This e-book provides a mix of information, examples and a few exercises. So that you can get started with those tools in an accessible way. My goal with this book is to help you to feel more energetic. Of course with tools that fit into a yoga lifestyle, so that you will deepen your yoga practice and knowledge at the same time. I will also share examples from my own life, so that it becomes easier to understand how the tools could work for you. No, this e-book is not about doing less (per se). It is about doing things differently. Tools that will help you create energy from everything that you put energy into. The more you work with these tools, the bigger the chance that your energy level actually changes. You could also look at it as an investment in yourself. Just get started with what feels right for you. That is automatically the next logical step. Everybody has their own path to follow, but if a tool resonates with you, it’s definitely worth a try. If you suspect there might be a medical indication for your fatigue, I urgently advise you to also contact your doctor. Are you done with feeling tired? Have you already made the decision to do something about that? If you would like to do this with the help of yoga lifestyle tools, then this book is there for you. Sign-up for our newsletter and receive this e-book NOW TEMPORARILY completely for FREE. 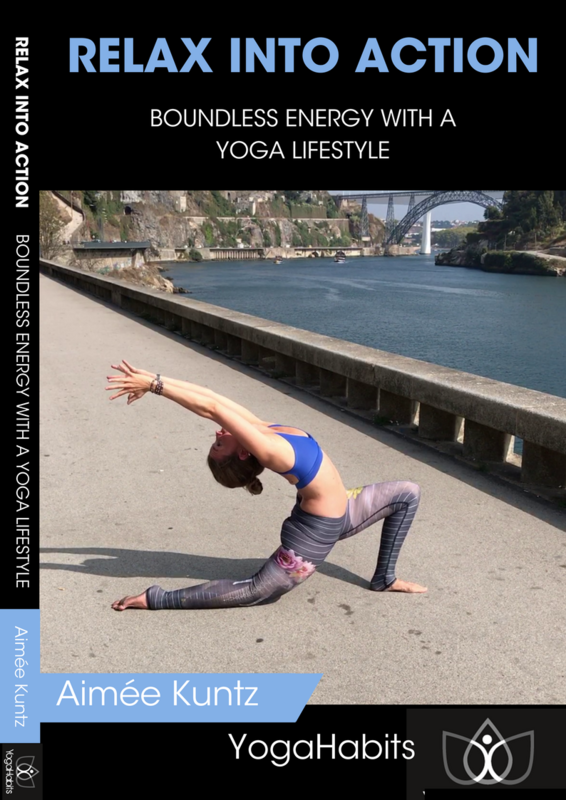 With 40 pages of yoga lifestyle tools to create an abundance of energy in your life. We work with a double opt-in confirming system to process newsletter subscriptions reliably. After subscribing you will receive an e-mail with a link to confirm your registration. After confirmation, you will receive an e-mail with the discount code for your next order. You will receive this e-mail with the discount code within 30 minutes after confirming. The quickest way is by subscribing by the form above (where you also include your language preference), since that goes directly to our e-mailsystem. Is the e-mail not in your inbox? Than please check your spam box (and with Gmail also your promotion inbox) and add YogaHabits to your contact list. Did you confirm that you are no robot and checked and then clicked on the button to register? Haven't you closed the web page to soon after submitting your newsletter subscription? It is always possible to unsubscribe from our e-mails via the link at the bottom of all our newsletters. But I sincerely hope that our e-mails help you on your yoga journey. Enjoy the e-book! And also check our yoga blog and Facebook account for more worthwhile information and yoga inspiration.